Stromberg has the best selection and highest quality GFRC Roman Corinthian Columns anywhere. They’re the largest column manufacturer; they’ll use their 30 years of experience to help you turn you vision into reality. Your glass fiber reinforced concrete (GFRC) columns will be made according to the Corinthian order, with distinctive proportions. The tops are intricately carved with two tiers of eight stylized acanthus leaves, foliage or flowers and the columns themselves can be plain or fluted. Stromberg Roman Corinthian columns in GFRC can be seen in office buildings, private estates and 5 star hotels, churches and courthouses. Our columns are for decorative purposes only; but inside or out, they will add a touch of grandeur to any setting and can increase your home’s value. Columns are one of Stromberg’s most popular products, and excellence has become their tradition in the crafting of these classic accoutrements. 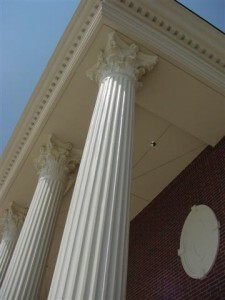 If you demand excellence, look no further than Stromberg Architectural Products for your GFRC Roman Corinthian columns. Stromberg Roman Corinthian columns have custom column caps to fit your décor. Your GFRC columns can be made in any size, diameter or height. Stromberg has more material choices for your Roman columns than anyone else. They can handle any size project, large or small. Their columns are available worldwide. GFRC can be molded into the intricate shapes and styles of the characteristic Roman Corinthian column. Stromberg has stock designs, but can also customize your columns for that out of the ordinary look. GFRC comes in a wide range of colors, stains and glazes; included are concrete and antiquing stains, cast in colors and custom hot glazed finishes. GFRC is a completely green product. Because it’s made of minerals, cement, aggregates and glass fibers, it has a low environmental impact. Glass fiber reinforced concrete is light and easy to work with. Your column installation will be quick and easy and your shipping costs reduced. GFRC has superior strength and can stand up to all kinds of weather conditions; it won’t crack or corrode. Experience the difference at Stromberg Architectural Products; they’ll walk you through every step of the process to make sure your GFRC Roman Corinthian columns fit your needs. Stromberg is here to help with CAD details, design assistance and specifications. Contact them today at 903-454-0904 for your free custom quote, and go with a winner.